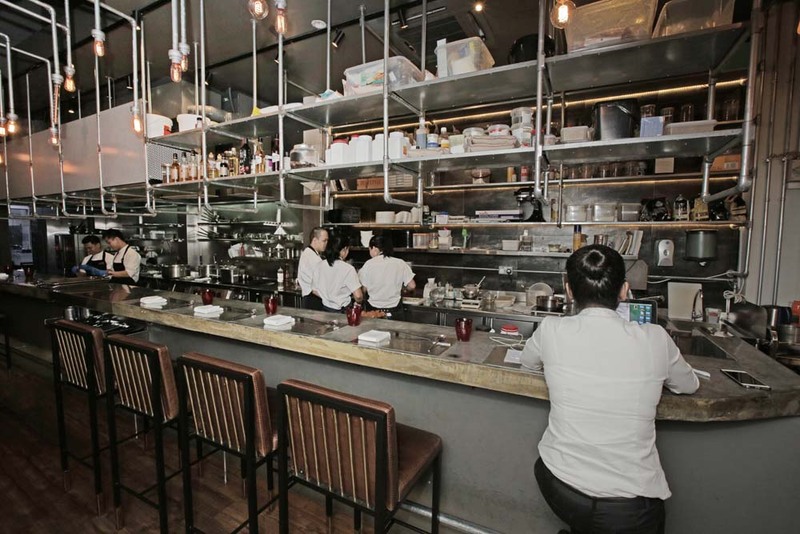 “Spanish Japanese Omakase Tapas“, is certainly an uncommon moniker and a real mouthful. A mouthful is precisely what one will get at BAM! 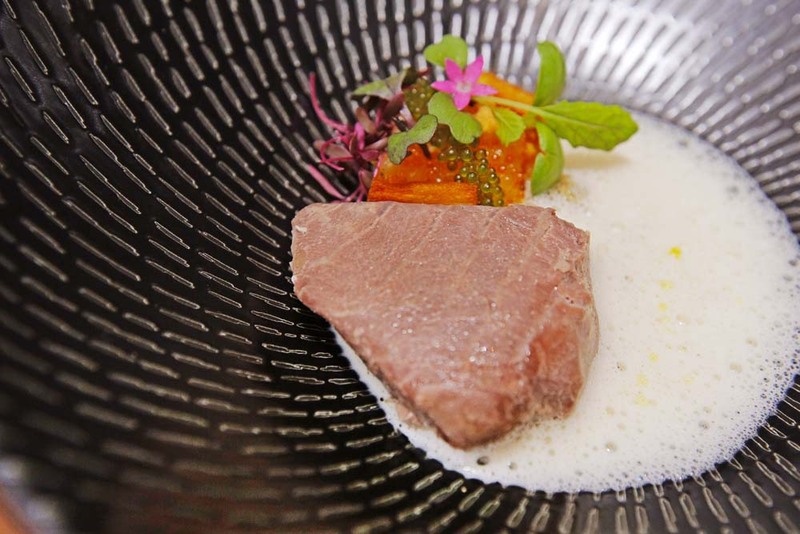 restaurant which is headed by Catalonian chef, Pepe Moncayo who cooks up a creative blend of culinary impulses and serves it in abundance, Omakase style. The presentation is decidedly Japanese, as is the optional sake pairing but the individual portions and accents are undoubtedly of Iberian origin. 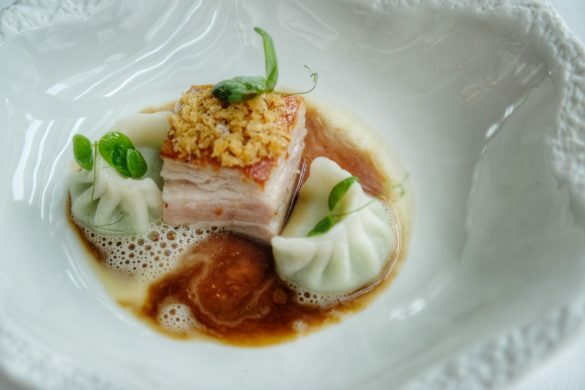 However, when asked about the provenience of the inspired creations and whether it could be geographically classified, chef Moncayo resolutely proclaimed them to be a sum of his experiences, his experiments and acumen rather than a mélange of meals from around the world. Pepe Moncayo, knows all about Michelin stars. 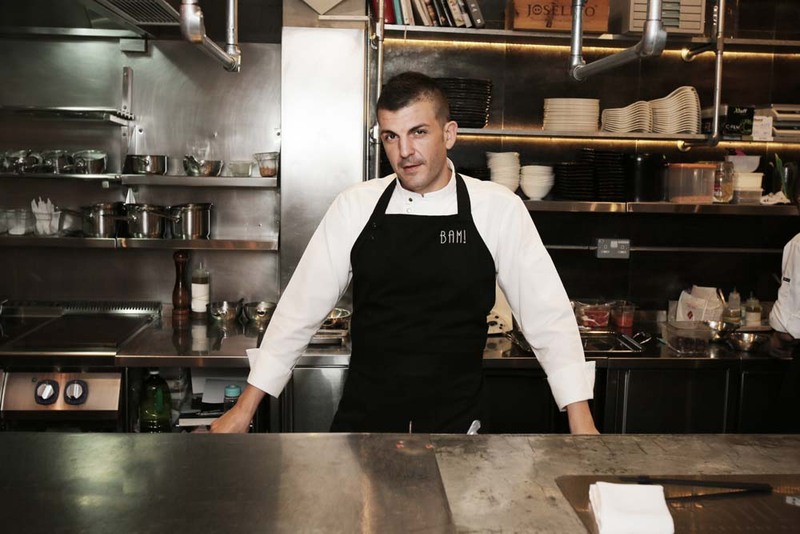 Having worked for many years in starred restaurants, especially at Santi as Chef de Cuisine, his reputation for gastronomic creativity has calling card. 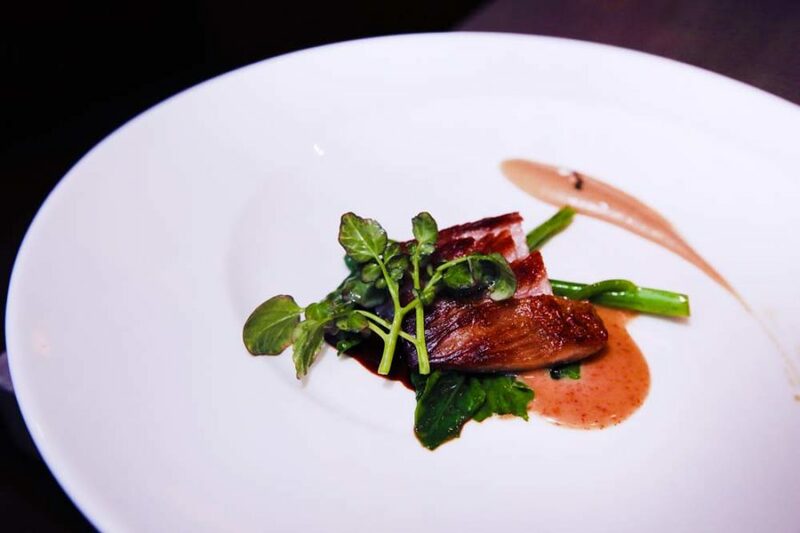 His penchant for experimentation and pushing the envelope of taste is evident in his insistence of sourcing ingredients locally and infusing them with those can only be found overseas to create distinctive dishes. As an enthusiastic seeker of unique ingredients, Pepe builds his creations around a variety of available produce, meats and spices. Never the other way around. The freedom of not having a dish to work towards or a recipe to restrain creative direction is his preferred mode of operation. 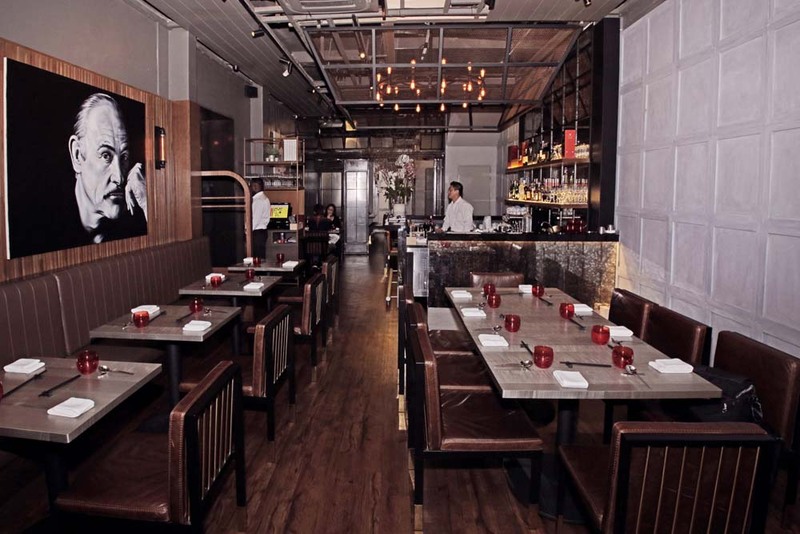 It goes without saying that the interior of the restaurant is similarly decorated in an unhindered manner. The omakase menu kicked off with a starter of pineapple gazpacho, compressed watermelon, and junsai. Junsai is an aquatic plant with a texture like straw mushrooms. It was crunchy and its savory flavor paired with the zesty pineapple gazpacho. Some dishes sound better in a foreign language. 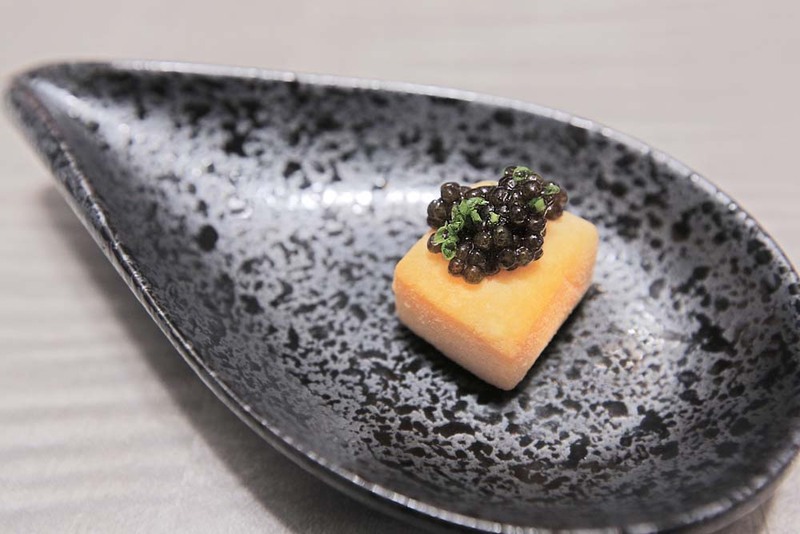 The Ankimo tofu with caviar places a dollop of black caviar onto a cube of monk fish liver. Offal parts aren’t usually very popular but this was very nicely prepared and lacked any of the expected fish taste. 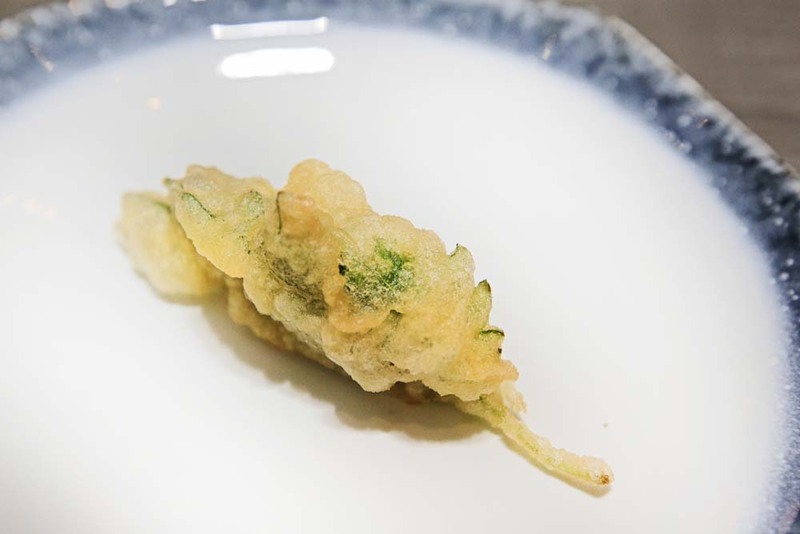 Take one crunch of the shiso leaf & tomato tartar tempura and you might be tempted to grab the one on your dinner companion’s plate. The batter is thick yet light and crispy, with the heavier flavour of the tomato tartar giving this crisp snack some weight. 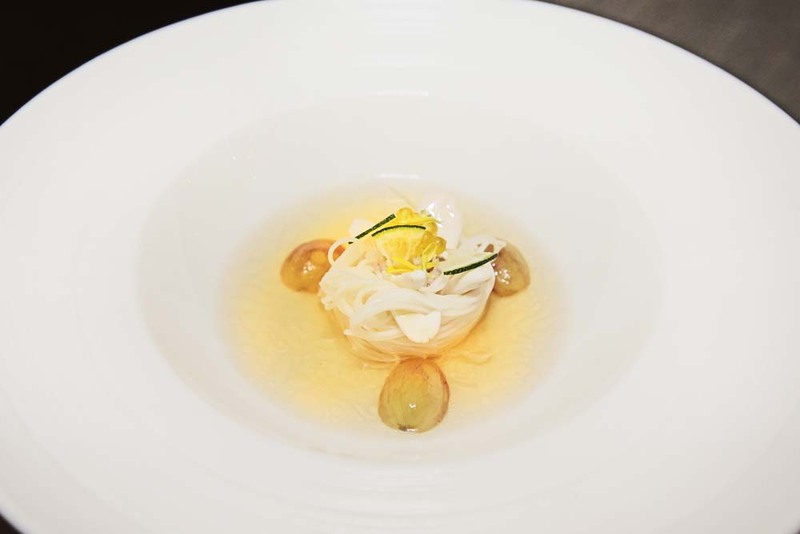 It is the tasty broth that is the star feature of the cold somen, fresh almond, and sudachi lime course. By this time, it was evident that Chef Pepe’ fondness for playing with his food influences his work. Here salty and sour come together harmoniously. 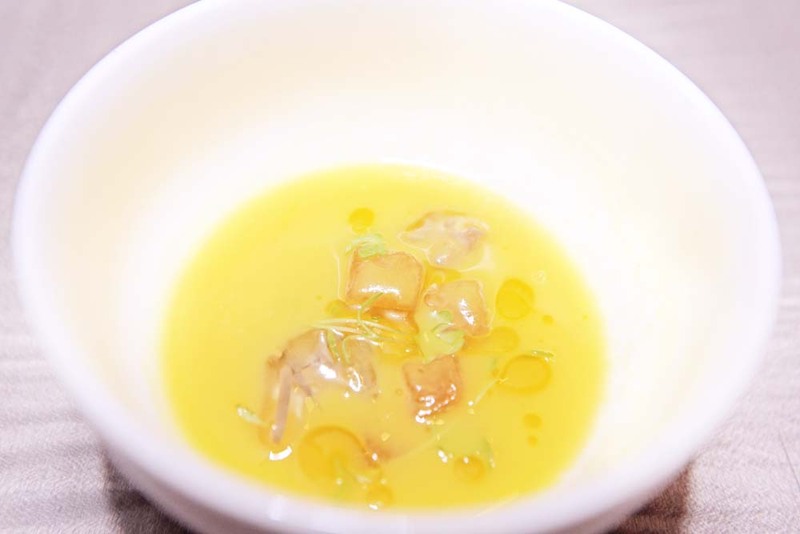 An example of a mix of styles, the green beans, ama ebi & uni, ponzu jelly, the soup’s base was very much a western styled potage, whereas the ebi & uni and ponzu jelly was certainly an Asian inclusion. By now, despite the bite-sized portions, I was surprised that I was starting to feel full. 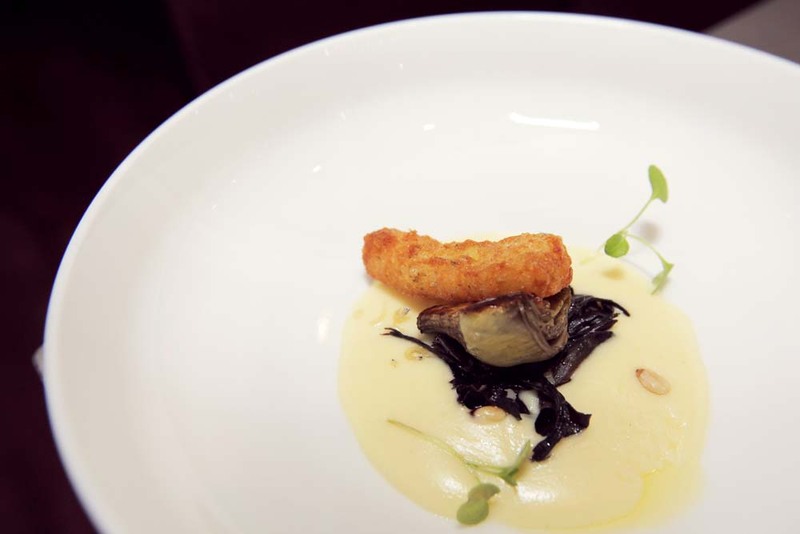 But, cod fish ream, artichoke, black trumpet mushrooms, cod fish tripe fritters couldn’t go uneaten. Again, the masterful creation served as a testament to the chef’s inventive spirit. 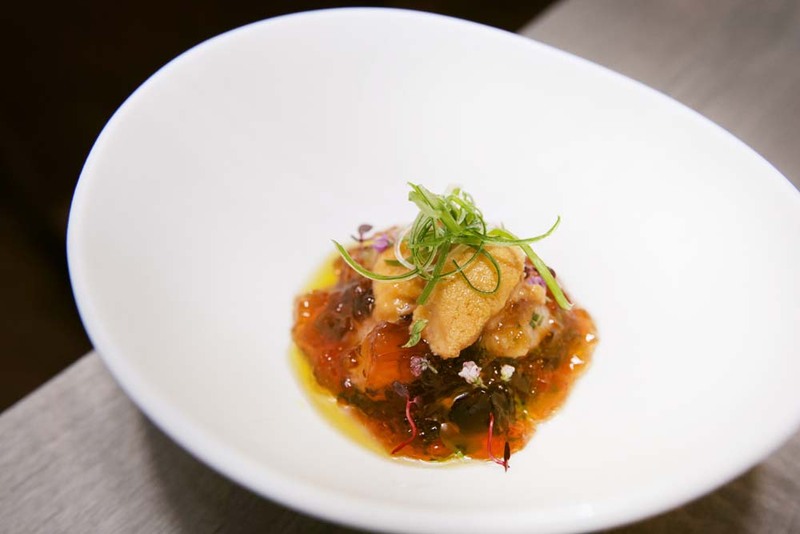 The most generously portioned dish was the Tuna Noten “Gazpachuelo”, Sago and Tobiko. Pepe’s insistence on using the freshest ingredients will show up here. The meat of the tuna was firm and did not disintegrate between the teeth like less perfect cuts tend to. The Espardenya is a variety if sea cucumber native to the Ibiza islands. 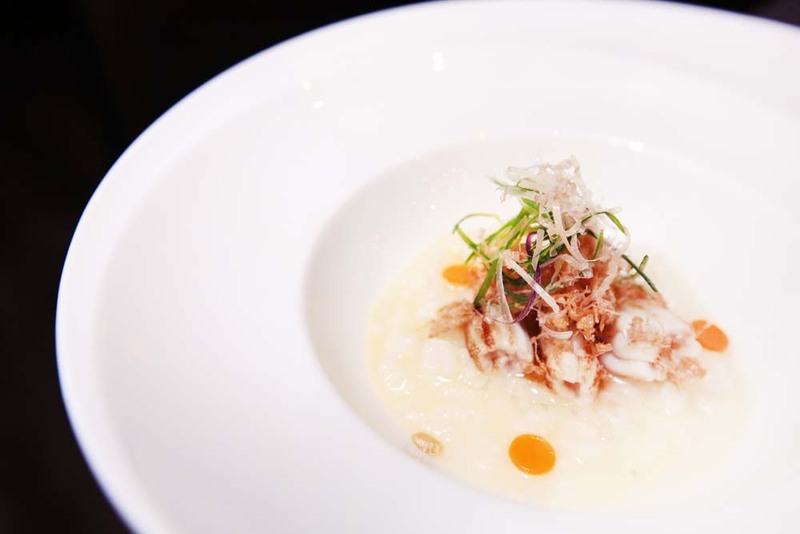 Stewed together with congee, the result is a comfort food dish that will whet any appetite. My favourite dish of the medley was the pork jowl, sesame onion, and emperor’s sprout. The charred crust with a tender juicy core made me wish that the menu was ala carte. Every bite was addictive. 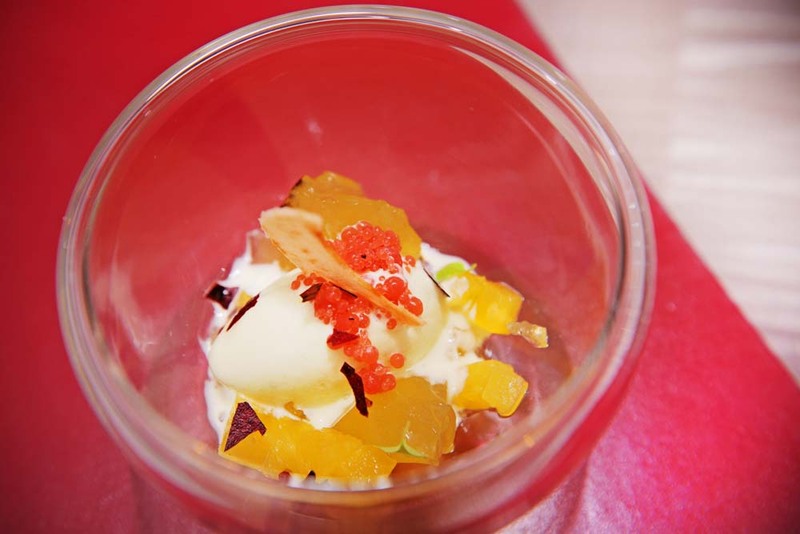 The mini yogurt ice cream & jelly, pineapple, blood orange caviar is one of a duo of desserts and a palate cleanser after 9 savoury courses. 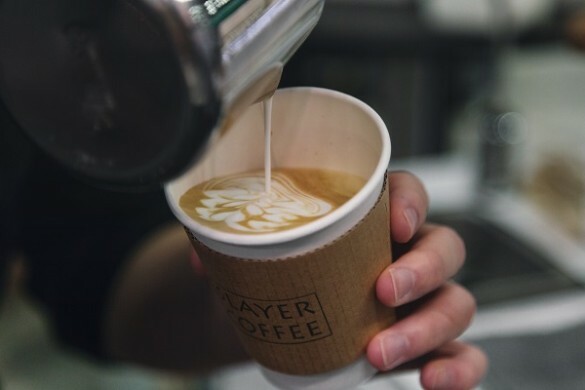 Tangy and sweet, you can skip the coffee after this. The sharp flavours are refreshing after that initial jolt. The almond & apricot dessert tower is made up of custard, thin white chocolate sheet , ice cream, wafer and cookie crumbs delicately stacked like rock cairns. 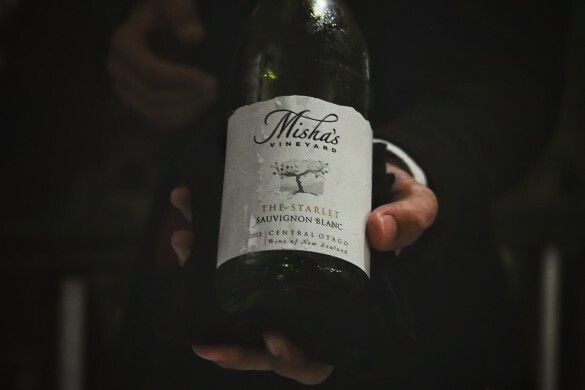 It is almost too elegant to eat but it’s impossible to stop at one mouthful after the first is taken. 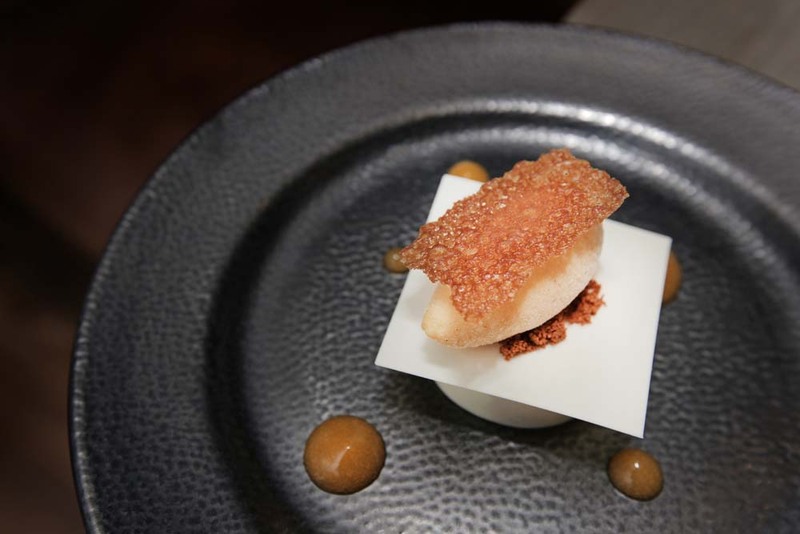 As much a play on flavours, the different textures stood out nicely, with the crunch from the caramelised sugar wafer and cookie crumbs contrasting with the creamier layers. To round off the meal, a pretty portion Petit Fours is served as the final flourish. 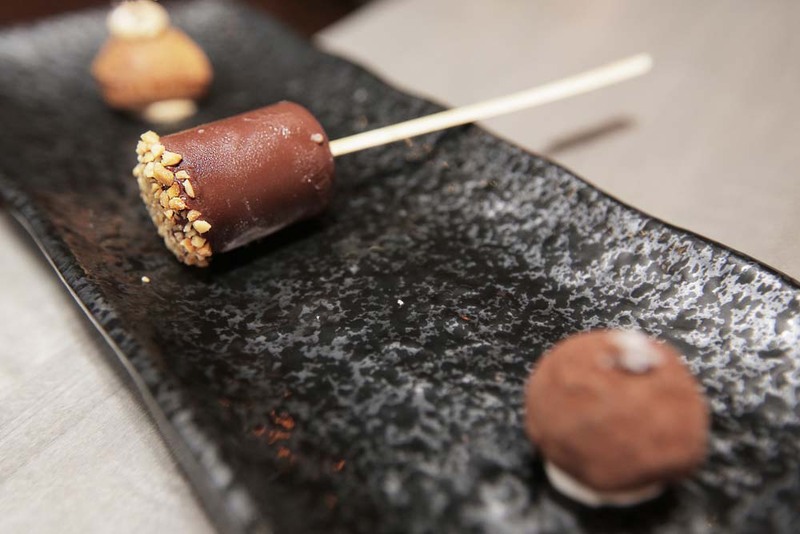 All made in house by dedicated patissers, the sweet treats are exquisitely crafted with every ingredient nuanced against the other in a complementary combination.